UE.UEC 04 (Motor Driven Grease Pump) | Products | Daikin Lubrication Products & Engineering Co., Ltd. 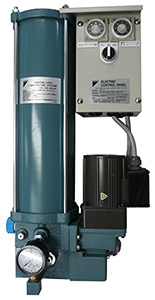 This motor driven grease pump is used in dual line systems.This automatic lubricating system has been designed to be simple and streamlined, and uses a single-piston pump mechanism which is driven by a geared motor. A compact size is achieved by adoption of a geared motor and integration of mechatronics. • Simple Pump MechanismAs a result of a non-spring check valve and single-piston pump mechanism, the pump mechanism is kept simple and is almost fault-free. Figures in parentheses ( ) are values when equipped with a control panel.